Last Friday, the Atlantic City Fire Department had a big problem on its hands, so to speak. Several members were getting promoted to the position of Battalion Chiefs and Fire Captains. As is the case in the New York-New Jersey area, the media is invited and it might not be front page news, but it is news nevertheless. So when someone forgot to bring a Bible for the swearing in ceremony at City Council chambers, it looked like a bad omen for a day that should have been filled with pride and happiness. Luckily, someone happened to have a great idea. One of the people attending the event was carrying around an Apple iPad. A Bible app was installed on the tablet, and the ceremony went on as planned. We're not sure that this would have been considered suitable for a presidential swearing-in, but it obviously met the regulations of Atlantic City. Feel free to click on the play button below to view the events as they transpired. Seperation of church and State indeed. Clearly you don't understand the symbolism behind the bible in situations like this. It has nothing to do with church, and everything to do with swearing you will be honorable and uphold your duties. Please go away. You anti religion zealots are just as bad as the religious ones, and each of your are equally irrational. What's more irrational than a religion? 'In situations like this' it doesn't symbolize anything because everyone has different beliefs. If there is anything sillier than putting your hand on a fairytale book its putting your hand on a glass screen with an image of the book. Good god you people are irrational. There is nothing inherently 'irrational' about religion. Notice, I don't mention a specific religion. It symbolizes something that most people in the world consider 'scared'. (I'm not just talking about the bible, it is what the bible represents in the situation)http://en.wikipedia.org/wiki/Oath However, I will agree, there is nothing sillier than using an iPad as a 'stand-in' for the real thing. As I said, you anti religion zealots are just as bad as those you mock. Please do the world a favor and stick your head in a running blender. Thanks, on behalf of the world, in advance. I would to escape this idiot ridden world of christianity winning over our laws in the USA, but sadly my blender isn't big enough for my head. Bible is a holy book of islam too, plz dont speak like that' even if it was not our holy book. and here is another Religious Nazi... dude i said about those people who did that! its bulls**t to use an electronic device instead of book.. True, but we have to believe in Mozes, Jezus and Mohammed! at one side, english people are so advanced in modern day technology and at the other extreme they beleive in things that do not make any sense at allllll....1+1+1=1 seriously? And I thought Steve's cult was a ruse..
People like this make me sick. No respect at all for other people. What 'people' did I disrespect? I spoke of an entity (Apple) and a superstitious practice (religion). Get over yourself, NOOB. The religious people are the ones who dish out the disrespect by constantly pointing fingers and judging others. You are obviously one of them. Can I get an AMEN!!! OOOOOHHH lawdy I can feel it in mah toes! Iphonearena you make it sound like no other device can do this.. umm there are bible apps available on the windows and android to. Whats the point of posting this? Because this time, an apple device was used. As for why it's on this website, I assume it's because it's a slow news day. I think it is pretty stupid that govenment officials have to swear on a 2,000 year old work of fiction. Until the Theory of Everything is brought to fruition, and the "god" particle is actually "seen", then you can't pass judgement on it being 100% a work of fiction. It's pretty stupid and naive of one to say that. Until god can be proven to NOT exist, who are you to judge those that still believe? Seriously? This is the problem with the world as we know it. According to most of you science and religion can't coexist, when actually the opposite is true. Thats the same for religious zealots, they believe that the two can't coexist. Does it all make sense, no, of course not. But it was also written by man 2000 years ago, and then translated by man 1000 years later. So please just keep your thoughts to yourself. Using an iPad (or any similar device) as a substitute for a Bible is one of those "great" ideas that should be followed by the statement, "Oh, wait, never mind. That was a dumb idea." I should've mentioned that there are about a dozen churches within a mile radius. The Mayor of Atlantic City fights with the Fire Department and Police Department daily, so the fact that it even got done is a miracle. I think that most of us here, whether Christians, Jews, Muslims, agnostics or atheists are here because we enjoy progress. Thousands of years ago they wrote holy writings on stone tablets. Then came papyrus, scrolls, the codex and bound books. The next natural evolution of reading IS electronic media. Or should they go back and start swearing people into office on handwritten scrolls or better yet some STONE tablets? Why does anyone get upset about this? Unless its because tax dollars could have been saved by using an actual bible. 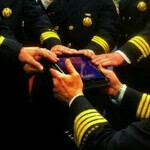 If these ipads were brought just for this function with tax dollars, thats upsetting. Religion is best marketed SCAM on Earth. Religious compulsions breed hypocrites.